Home Arizona CIH driving industrial hygiene Industrious Hygienist occupational safety and health professional OSHA PPE safety National Safety Month Starts Tomorrow! National Safety Month Starts Tomorrow! June is National Safety Month! The Industrious Hygienist will be very busy in June. I'm scheduled for a four-day Occupational Health and Safety Administration (OSHA) 501 General Industry Outreach Trainer class; this will allow me to provide 10-hour and 30-hour General Industry training to my clients and my future graduate students at Embry Riddle Aeronautical University - Prescott. Thanks to the Arizona Safety Education Center for holding the class. The instructor will be the *illustrious* Harold Gribow. I'm also super-excited to attend Safety 2013 in Las Vegas. I've signed up as a moderator for three sessions. This conference is through the American Society of Safety Engineers (ASSE), and I am stoked to meet the other members of the Industrial Hygiene Practice Speciality (IHPS) and the Healthcare Practice Specialty (HPS). The National Safety Council (NSC) chose the theme "Safety Starts With Me" and has four focus areas for each week in June. Per NSC, "Successful organizations engage everyone in safety and create a culture where people feel a personal responsibility not only for their own safety, but for that of their coworkers, family and friends. While leadership from the top is important, creating a culture where there is a sense of ownership of safety by all, makes everyone in the organization a safety leader." On the NSC website, you can sign up for free safety materials, make a safety pledge, and if you're a member, there free weekly webinars and downloadable posters. 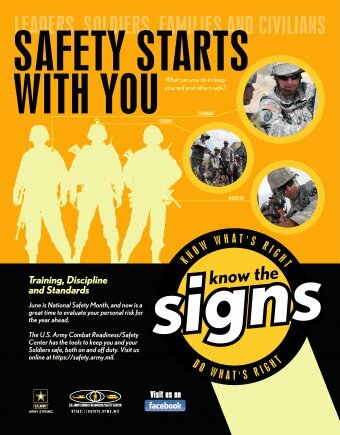 The U.S. Army is joining in National Safety Month as well. They are dedicating a campaign to safety's significance in four key areas: civilian injury prevention, ground operations, aviation operations and off-duty driving. I especially like the slogan on the poster: "Know the signs. Know what's right. Do what's right." This encompasses very important facets of safety, including education of employees (they can't "recogize the hazard" if they don't realize it is a hazard) and the emphasis on employee engagement in safety. 1.) Set a company goal for AED/CPR training: Sudden cardiac arrest (SCA), a stoppage of the heart, causes an estimated 15 percent of workplace deaths. Employees who are well-trained in both CPR and automated external defibrillator (AED) use will be fully prepared to respond when SCA occurs. Set a company-wide goal to get a large percentage of workers certified and recognize those individuals who participate in the program by hosting a lunch or picnic. Enlist the help of a training provider and American Heart Association (AHA)-certified instructors to highlight proper AED use and CPR technique. 2.) Fit employees for PPE: Since PPE is only fully effective when it fits correctly, and employees are more likely to wear it when it fits, National Safety Month events are a great opportunity to size employees for gloves, eyewear, hearing protection and protective apparel. PPE that fits properly will not inhibit movement or comfort, but will be tight enough to protect employees during daily activities. Set up fitting stations with several sizes and have a representative on duty who can maintain a log of employees� sizes to make future ordering easier. 3.) Host a safety contest: To keep employees focused and enthusiastic about safety, use contests and trivia to test employee knowledge about correct safety practices. For example, use an �identify what�s wrong with this picture� contest and have employees submit answers for prizes. To maintain engagement over time, launch a recognition program that rewards certain departments or individuals who have shown an exemplary dedication to workplace safety. 4.) Test fire extinguisher skills: Pick a vendor that can be on-site during safety events to train employees on proper fire extinguisher technique using a fire simulator. Then, test employees� knowledge with oral quizzes and online training courses. In addition, make sure employees know where all extinguishers and exits are located throughout the facility so they can be fully prepared if a fire occurs. 5.) Teach emergency response: A common misconception is that employees know how to properly respond in the event of an emergency. Use safety awareness events to teach employees proper response including evacuation protocol, first-aid techniques and how to call for help during an emergency. Assign stand-out employees to emergency response teams that can correctly handle chemical spills, fires, natural disasters and SCA. What's your plan for National Safety Month?